William has loved StarWars for a while now. We weren’t quite sure where he was first introduced to StarWars but I think the influence is all around him, from Jason’s old StarWars sleeping bag that Erik’s been using for a few years to friends that have figurines to the Lego StarWars sets they’ve received as gifts and even Lego StarWars games on the computer. But Jason was getting quite concerned that the boys were getting a wrong view of StarWars because they have never seen the movies. And by ‘the movies’ he meant of course the original trilogy, none of this episodes 1,2 & 3 stuff. Jason refuses to see them or even acknowledge them as real StarWars. So this weekend we decided that the boys were now old enough to watch the movies and on Sunday afternoon when Sophia went down for a nap, we broke out the DVD’s and watched Episode IV – a New Hope. They were mesmerized… it was a huge hit and of course they loved it. And what’s not to love? Luke – the petulant, pouty jedi-in-training, Hans Solo, the bad-boy and of course bossy and beautiful Princess Leia. So now the boys are well versed in the ways of the force. *Disclaimer – I did skip the part where Luke sees the bodies of his aunt and uncle, I still find that scene disturbing. I think we will view Jason’s favourite, ‘The Empire Strikes Back’ next weekend, but I don’t know about return of the Jedi.. I think the content might be a bit too mature… we’ll see. You know what’s funny though, is that we waited to show the boys the movie until they were old enough – but Sarah saw it too and she’s 4! Isn’t that just the way it is with subsequent kids? The first one has to follow all the rules and they all get broken for the younger kids. I had many high ideals when I first had Erik, for instance we never let Erik drink pop until he was 4 or 5 – but Sophy get a tiny bit when we eat pizza because everyone else is having it. Erik didn’t watch TV until he was two – as per the recommendation of the Pediatric Society – but then William watched it with Erik and he was not 2 – neither Sarah or Sophia for that matter. It’s funny how our attitudes change… and we relax a little when we get more comfortable with parenting. But now all the kids have lots of costume ideas for next Halloween – Sarah wants to be “Chabaca” – Chewbacca and William and Erik are fluctuating between stormtroopers and Hans Solo and I think I’ll dress Sophia up as a tiny princess Leia… I can hardly wait. 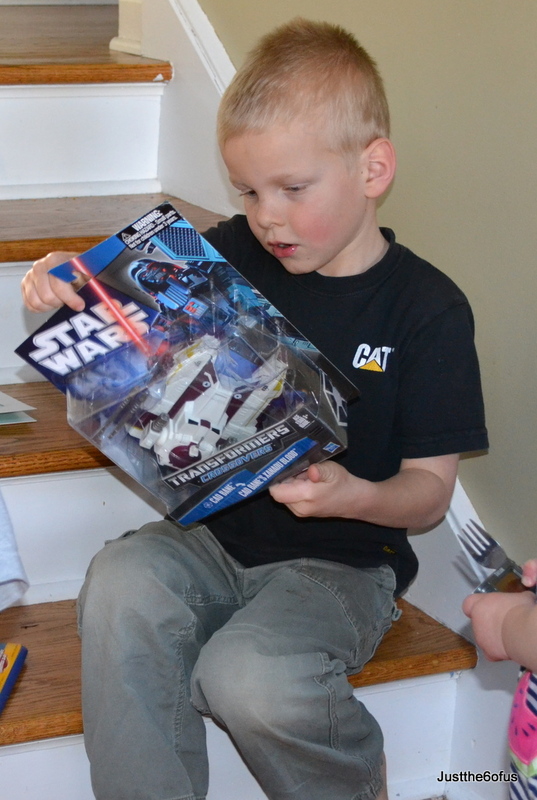 More Star Wars – thanks Aunt Daila! And it even came complete with a Yoda birthday card that plays the StarWars theme when opened… I’ll just hide it before it gets annoying. So as I said before we are now well versed in the ways of the force and if the kids start hitting each other with sticks to mimic light sabers, at least we will know we brought it on ourselves. Hey thanks for stopping by my blog the other day! Just wanted to let you know that I finished my ottoman and posted about it today. Have a great day!